Welcome back to our blog, its been a while as we have all been so busy with new products, new devices and planning for a big move. All very exciting stuff…..so here’s our news. We had a hugely successful show at Olympia Beauty, thanks to all who stopped by, new friends and old (but young looking!). We were there to showcase our newest device the “mighty” M3. 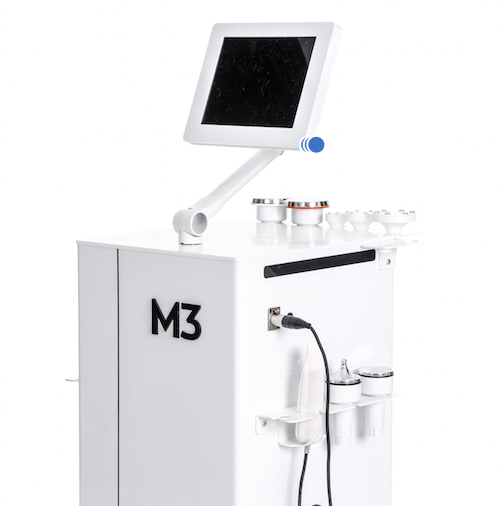 The M3 is made in Poland and offers 8 treatment modalities in 1 platform. It is able to connect to WiFi and equipped with Reactify software which can diagnose and fix technical issues before they become an issue. Automatic updates keep the system working to its maximum potential. Skin Rejuvenation is a key goal for any skin therapist, body or face and for any age or cultural demographic. The M3 is the answer to “skin goals” addressing an array of skin conditions with this multi-module device. So to Body Treatments: Dermomassage, also known as Endermologie. Deep tissue massage using vacuum, to improve the appearance of cellulite and stretch marks. Stimulating metabolism, improving blood and lymph circulation and reducing water retention. For more evenly toned, smoother skin. Ultrasound Liposuction, targets stubborn fatty areas. Used in conjunction with Dermomassage to improve appearance of cellulite, break down fat cells and remodel. Finishing with Radio Frequency for face and body. The ultimate technology for skin tightening. Many of these treatment modalities can be combined to provide the best possible treatment outcomes.